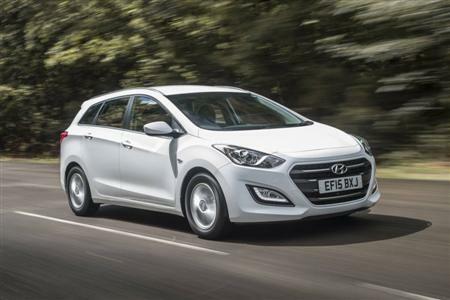 The wagon version of Hyundai’s big-selling i30 has received important upgrades in its latest Series II guise, including a 7-speed DCT (Double-Clutch Transmission) as standard. Also new across the two-tier i30 Series II Tourer range is a rear-view camera as standard equipment, together with a host of changes which make the stylish and versatile small wagon even more functional. The i30 Series II Tourer now comes in two model variants: Tourer (which replaces the previous Active) and Tourer Elite. Entry-level Tourer is available with Hyundai’s 1.6 GDi Petrol or 1.6 CRDi Diesel engines, while Tourer Elite is available exclusively with the 1.6 CRDi Diesel. Both petrol and diesel engines now come standard with Hyundai’s advanced in-house designed 7-speed DCT. The i30 Series II Tourer range has adopted the larger hexagonal grille featured on the i30 Series II hatchback at launch earlier this year. The new grille incorporates black horizontal slats with satin chrome inserts, and its design more closely aligns both the i30 Series II hatch and Tourer range with their upmarket all-new Sonata and Genesis stablemates. Also new on i30 Series II Tourer and Tourer Elite are dynamic new-design 16-inch machined-face alloy wheels with gunmetal grey inserts. The i30 Series II Tourer and Tourer Elite now also feature as standard the clever rear-view camera introduced with i30 Series II hatchback. The camera image is displayed on the new 5-inch in-dash multimedia touch screen in i30 Series II Tourer, and the carry-over 7-inch touch screen in Tourer Elite. The rear-view camera augments the i30 Series II Tourer and Tourer Elite’s four-sensor rear parking assist system. Inside, i30 Series Tourer now features a 5-inch touchscreen audio system with outstanding connectivity options including Bluetooth, USB, auxiliary input, digital iPod and MP3 compatibility. The upgraded audio system in i30 Series II Tourer also offers Pandora® internet radio capability when tethered with a compatible iOS or Android smartphone. If installed, users are able to interact directly with the Pandora® app on their smartphone via the multimedia display. The i30 Series II Tourer Elite variants continue to utilise the existing 7-inch touchscreen satellite-navigation system. The i30 Series II Tourer range now comes exclusively with Hyundai’s advanced 7-speed DCT (double-clutch transmission), replacing the outgoing model’s 6-speed automatic transmission. The new DCT was launched earlier this year as an option- on CRDi-engined i30 Series II Active hatchback and standard on the diesel-only Premium hatchback range flagship. Seamless in operation, more fuel-efficient and offering more performance than the six-speed automatic it replaces, the new 7-speed DCT transmission features a twin-plate dry clutch design. The i30 Series II Tourer range is available with either Hyundai’s impressive Gamma 1.6 GDi petrol or U-II 1.6 CRDi diesel engines. The U-II 1.6 CRDi diesel engine has been significantly upgraded with power output increased to 100kW (up from 94kW) and peak torque now an impressive 300Nm (up from 260Nm), while fuel economy has improved by 1.0l/100km. Hyundai iCare offers a comprehensive suite of owner benefits including; Lifetime Service Plan, 5 Year Unlimited Km Warranty, a Sat Nav Update Plan, complimentary Roadside Assist for 12 months on new vehicles, a Roadside Support Plan for up to 10 years, 1,500km complimentary first service, a dedicated Customer Care Centre, myHyundai – exclusive owner website, customer events, and more (conditions apply).